Maybe we’re overstating our altitude, as we still haven’t reached our highest point in Turkey, but when its 35degC, they definitely feel like mountains! The combination of slight headwind, poor surface and humid weather are a killer for progress!! 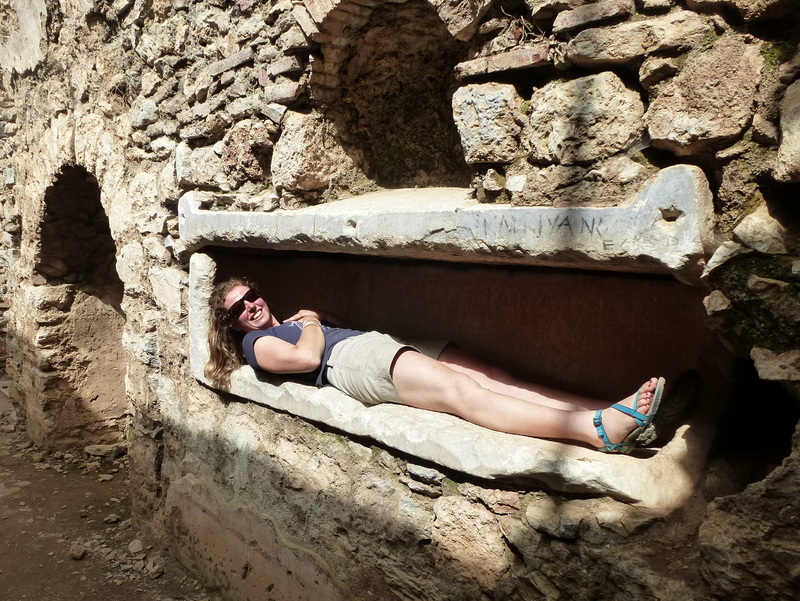 From Istanbul we took a 2 hour catamaran ferry across the Sea of Mermara to Bandrima. 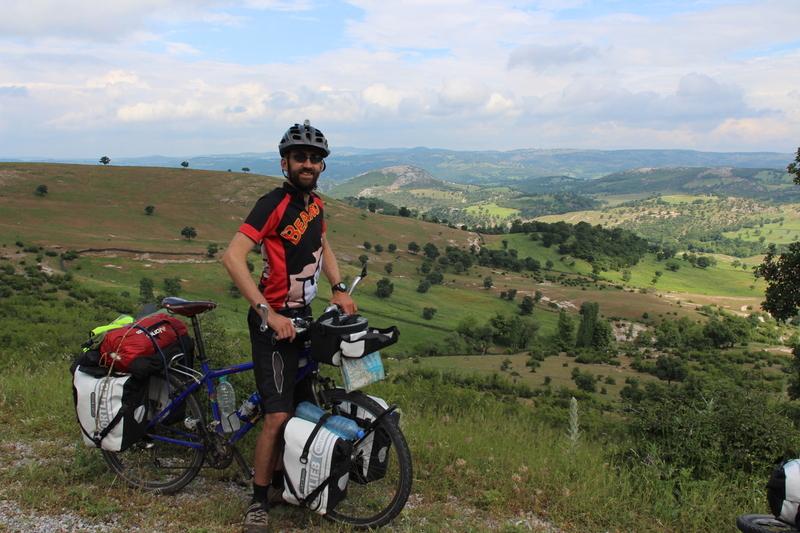 As this was our first ride in over a week, we took it easy with a short pedal to a nearby campsite for our overnight stop, before properly getting back on the saddles the next day and heading South up and over the previously mentioned hills. 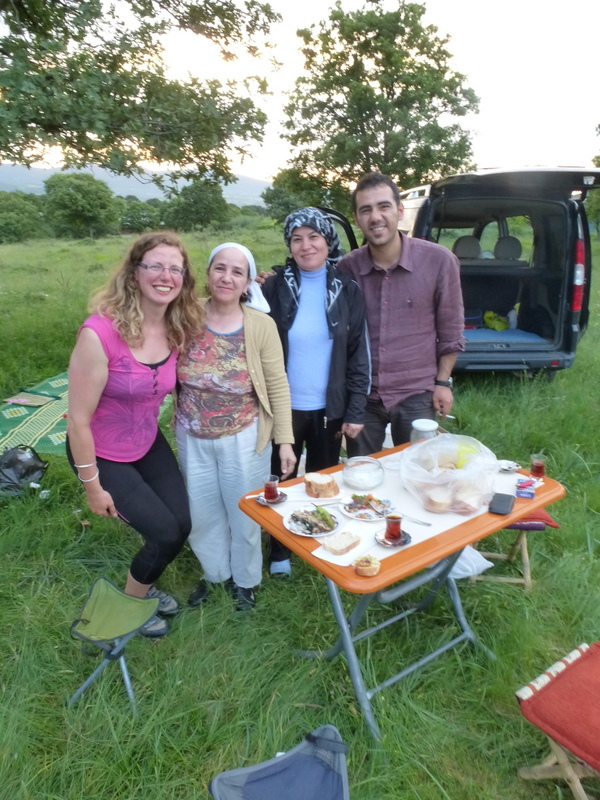 That evening we were looking for somewhere to stop when we spotted some locals having a picnic so headed across to ask if they thought we would be okay to camp… Turkish hospitality meant that as we pitched our tent we were invited to join their fish supper, despite having full stomachs (having just eaten at a cafe in the nearby town) we spent an enjoyable evening in their company as more and more cay was poured! A day on, and up in the hills and far away we stopped to ask a Shepard if we could camp ‘over there’ (using international language of mime). 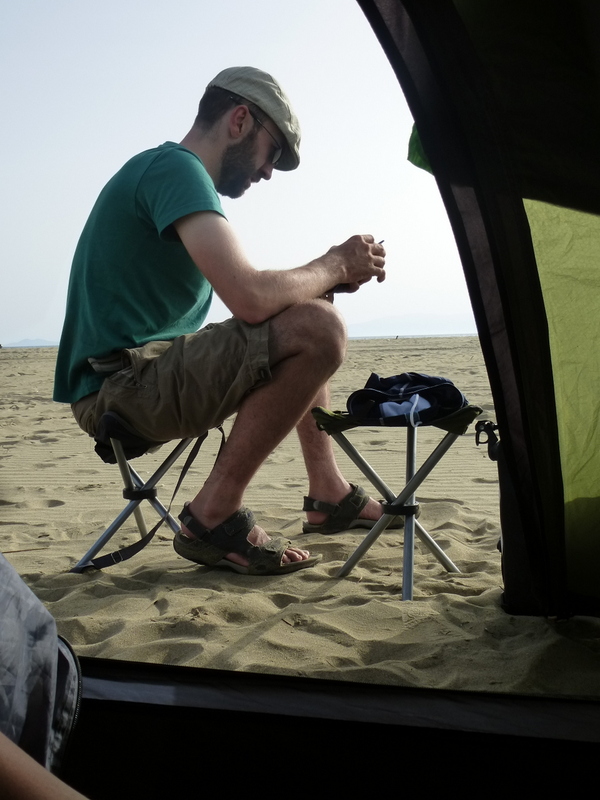 As we were pitching our tent he came over and showed us to a more hidden spot, so we took his advice and relocated, he even came back in the morning to check that we were okay. Thank you Mr Shepard! Through more hills and beautiful scenery we got our third puncture of the trip (not bad for over 2000km), we stopped under a canopy to hide from the rainstorm and patch the tube, as Tim was putting the tyre back on, the fire station crew came over and insisted that they start up one of their trucks to re-inflate our tyre with its air compressor! It probably would have been faster to pump it by hand but they insisted that they wanted to help. With the wheel back on, the rain had eased, so we continued. 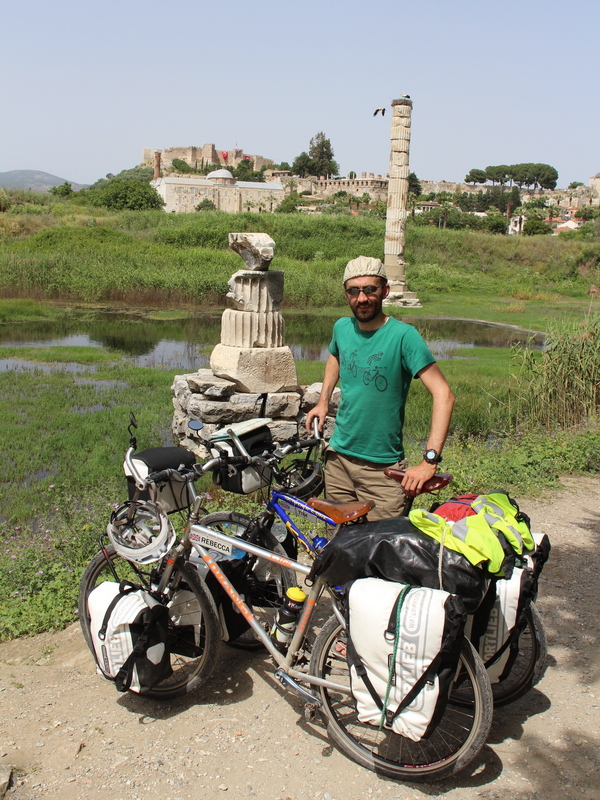 After four days of being in the hills we headed down into Bergama, where we camped in the grounds of a guesthouse with the friendliest owner you have ever met! 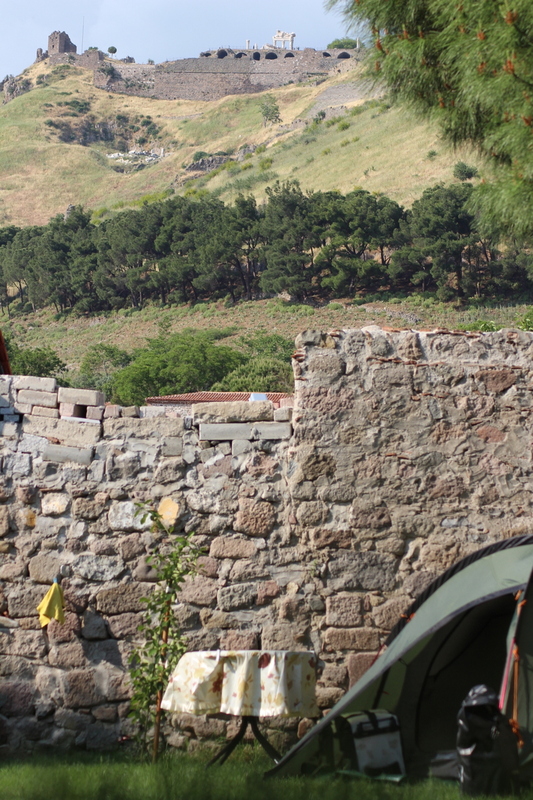 Made even better by the fact that we could see the ancient ruins of Pergamon from our tent! 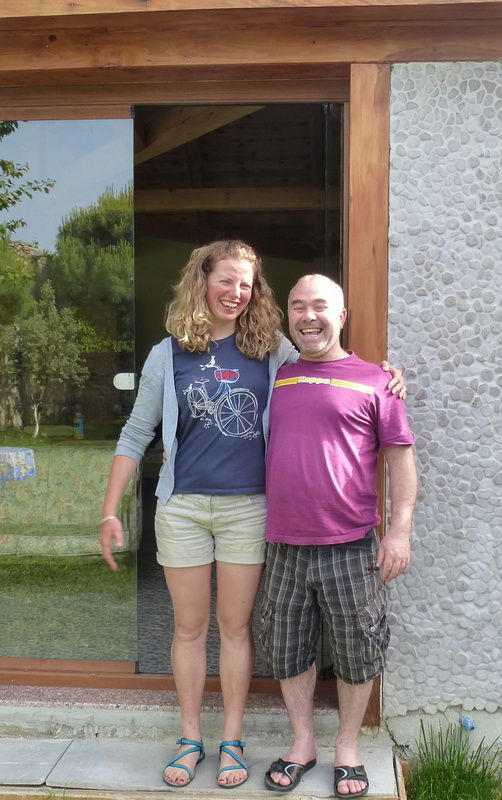 Whilst fixing that puncture a couple of days earlier Tim had spotted that Rebecca’s rear wheel was about to fail – the brakes had worn away the rim causing cracks in several places, and one of the spokes was also pulling out. 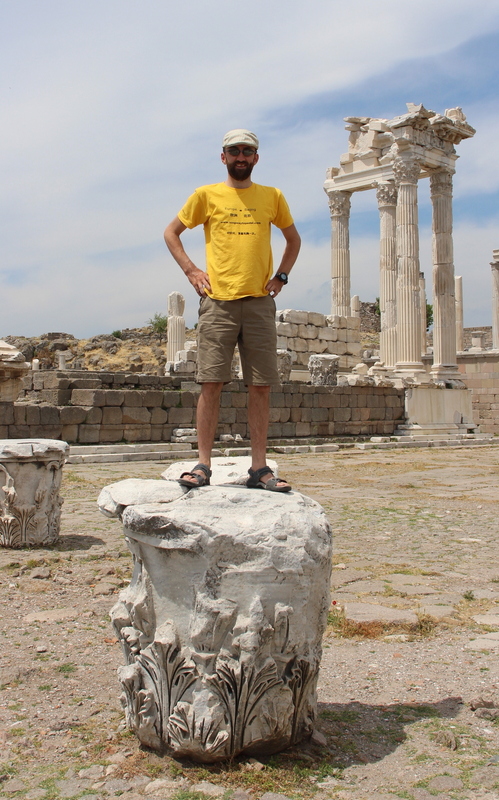 Fortunately it held together long enough to reach Bergama from where we had already planned to get a bus and avoid the motorways around the big city of Izmir. At the bus station our ‘bicylettes’ were met with the response “problem, problem!”, after Tim removed more and more bits and 3 trial fits, we were eventually presented us with 2 tickets, hooray! 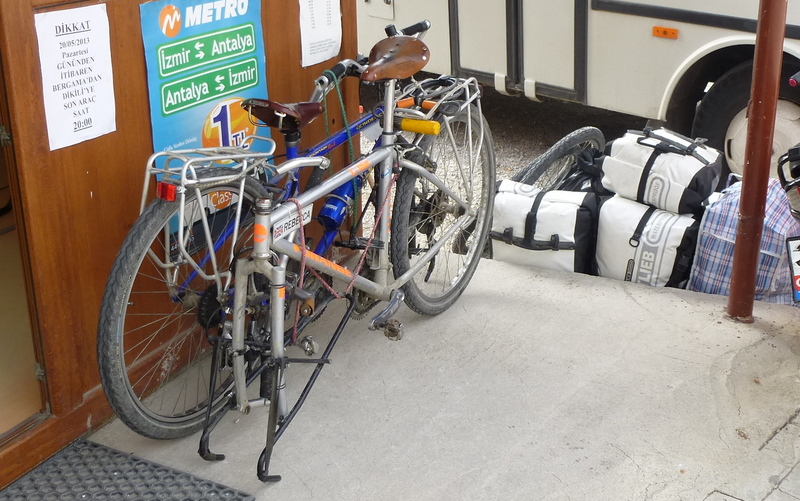 After a detour into central Izmir to buy the new rim we were back at the main bus station to continue our journey to Selcuk. Fortunately this time the bikes and bags went on without fuss, but unfortunately the driver then increased the previously agreed price. We offered a fair price for the tickets plus extra for the bikes, but no bartering occurred…….after he started unloading our gear we had no choice but to pay up. It was annoying but we were glad to be continuing the journey. That night, the new rim was swapped over in the campsite laundry room, so in all – a successful mission! Leaving Selcuk we took in some of the free sights but skipped the popular Ruins at Ephesus (too busy and we were getting a bit ruined out), before heading to a night of camping on the nearby beach. 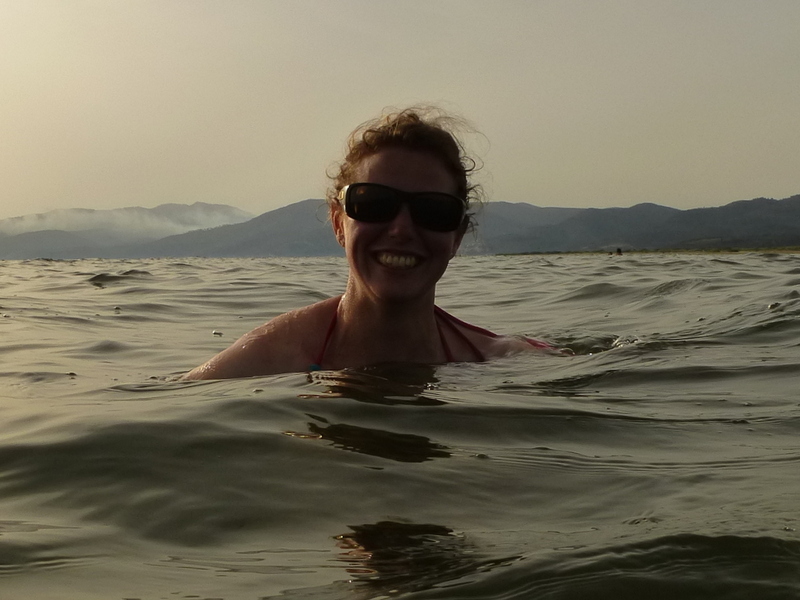 It was a lovely setting and a very nice refreshing swim, but could have done without the party lorry that arrived just before dark and the locals driving onto the sand and practising their drifting skills in their RWD Fiats, it must be their Saturday night entertainment! 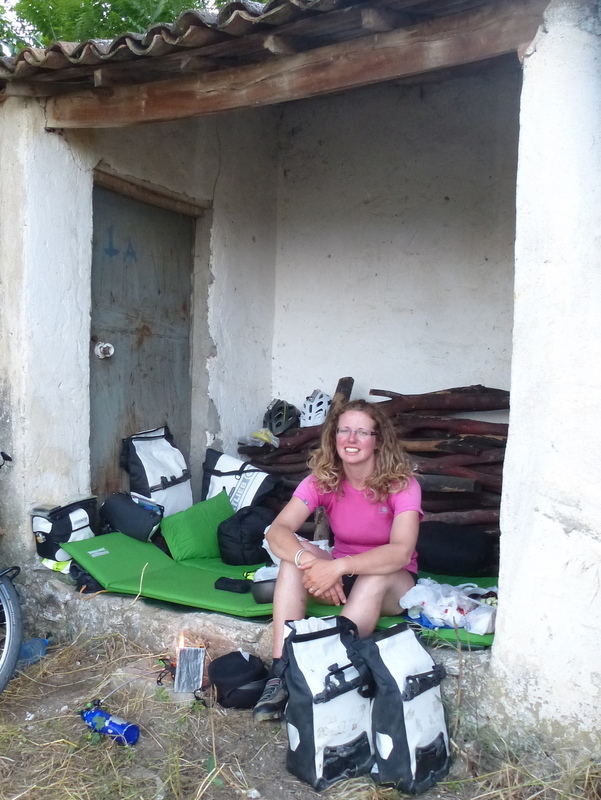 On the run from the Agean coast to Pamukkale, the terrain became flatter and our usual sleeping arrangements changed. The first night was under a barn/shed roof in the corner of a field! It was great to not be in the stuffy tent for a change! (Only Tim got bitten a little.) When the farmers arrived in the morning (on scooters) they looked a bit surprised, but as we’d been woken by the sunrise, we were mostly packed up and as we set off they returned a friendly wave. (We think!) Not needing to de-tent, we were back on the road very early (07:30) and making excellent progress before the day got too hot. However, despite numerous cafe visits, ice cream, cakes and a stop to dance with a wedding party making their way through a village(! 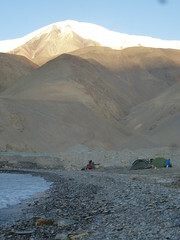 ), we called it a day at 110kms. We were too worn out to make the intended camp, so stopped at the next town and found dinner. Asking where we could camp we were directed to the local park where the cafe owner said “no problem”. We’d pitched up and were waiting for darkness, when the cafe owner plus 3 others came over and advised us that the ‘Poliz’ were on the look out for an escapee (??!) and that we should sleep inside tonight. The owner indicated that we could sleep in the cafe once it had closed, so we packed up and ordered a Pepsi whilst waiting for the evening to unfold. Tired and drinks finished Tim re-enquired where to sleep and we were gestured onto the bikes and to follow a car…… driver and detestation unknown….. we eventually arrived at the Forestry Fire Station were 2 friendly chaps greeted us, showed us the spare room and got the cay brewing!! Thank you very much kind people! 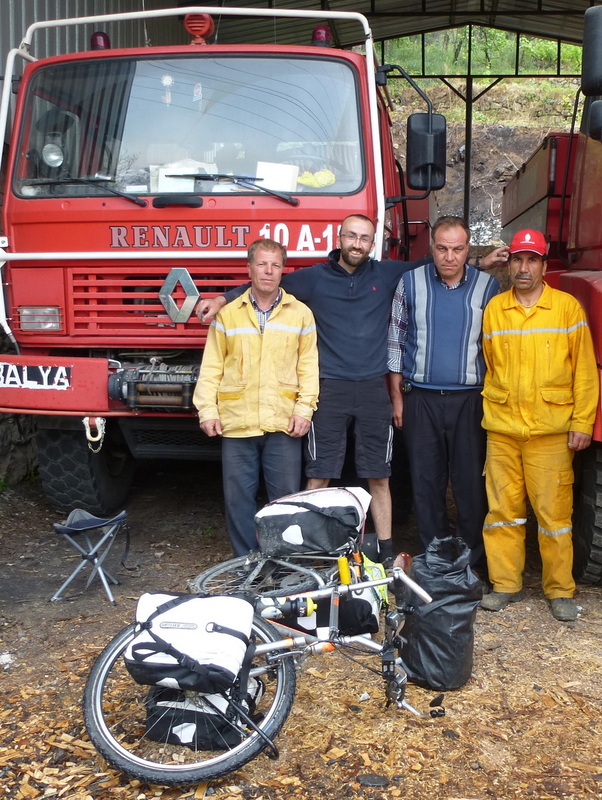 After a quick photo in front of their main appliance we were off along the valley floor with mountains either side… more easy pedalling please! 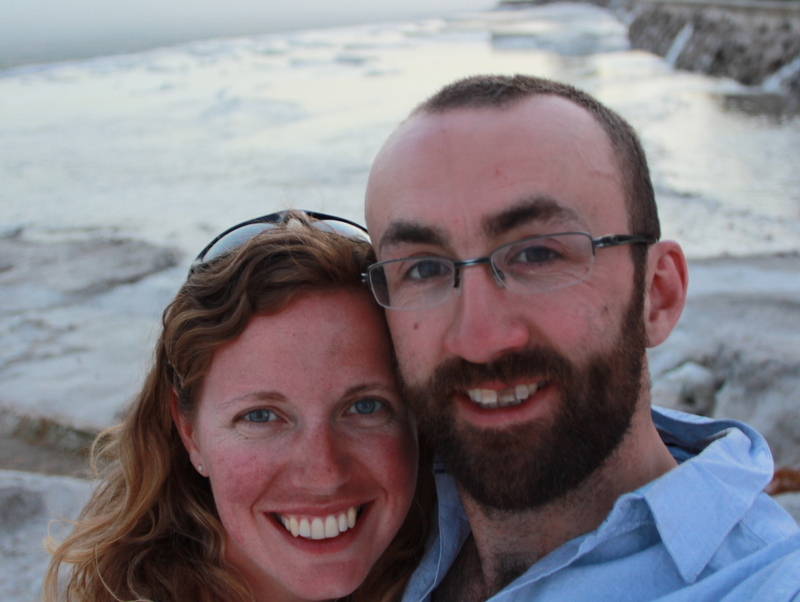 We finished the remaining 46km to Pamukkale the next morning, ate an entire watermelon between us (cost: £1.79!) and then jumped into the swimming pool to cool off. 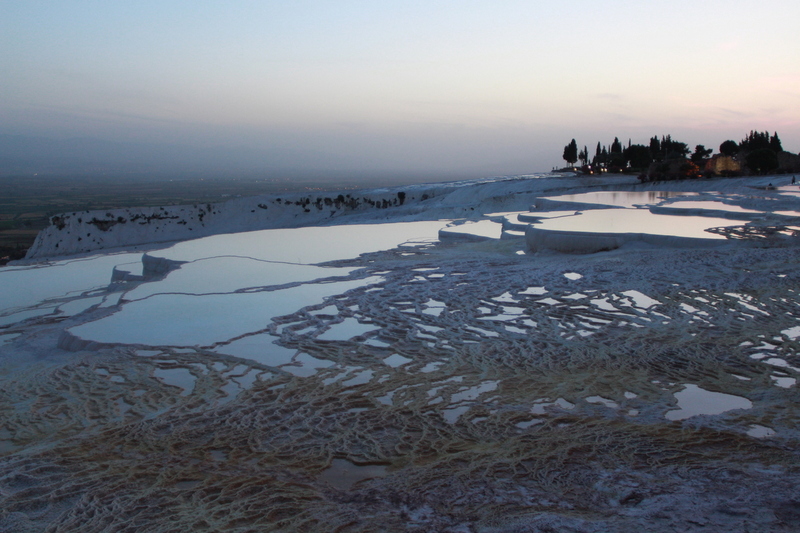 We visited the travertines – the limestone deposits from the hot springs create these incredible watery pools in the white rocks that run from the top of the hill down to the village. It’s open 24hours so we visited in the evening to see the sunset and avoid the coach parties, the evening light also tested our camera skills. 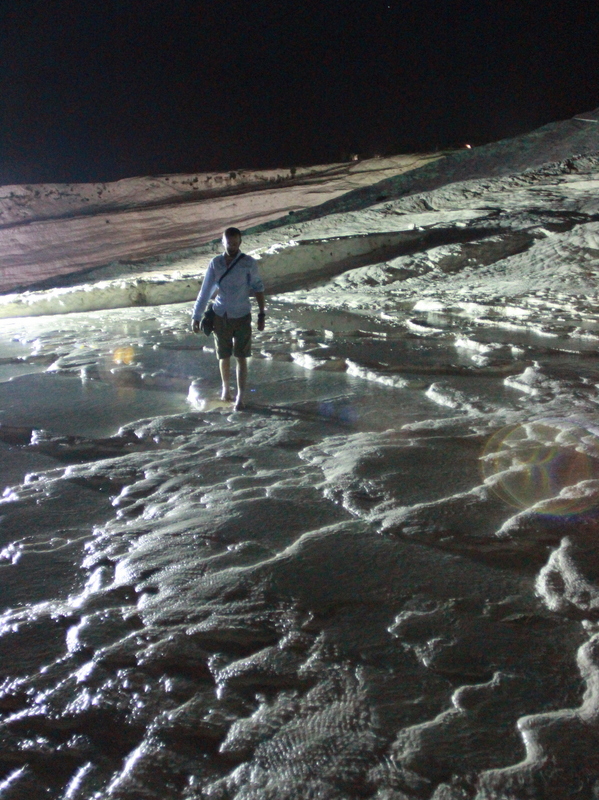 Walking back down the pools in twilight we think it looks a little like the moon! 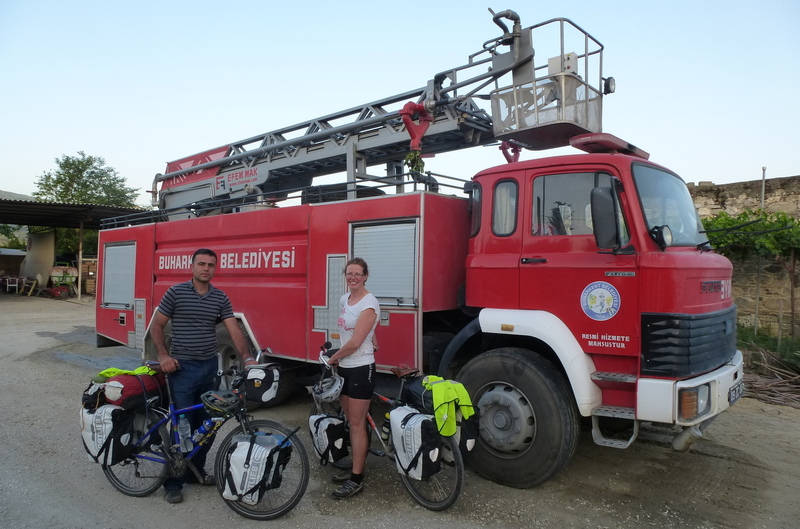 From Pamukkale we will continue to head east but we can now see mountains with snow on their tops, not wanting another ‘army mission’, we’ll be taking a coach 450km to Konya and then pedalling into and exploring the Cappadocia region.